For various reasons, Ireland is one of the more anti-Israel countries among the Western democracies. But there has been a steady growth in pro-Israel activism in recent years. I happily define myself as "right-wing" (classic liberal right) but not all pro-Israel people do. I suppose there is no reason why support for a secular liberal democracy in the conservative reactionary Islamic Middle East should be a "right-wing" thing. There is some criticism of this group: Why I am not an �Irish Friend of Israel� by the pro-Israel Donnchadh O Liathain, Jerusalem Post, Sept 28, 2004. Cliona Campbell, a brave young Irish woman who volunteered for the IDF. Good for her. "People see me as a terrorist", Sunday Tribune, 8 Aug 2010 (or via here). 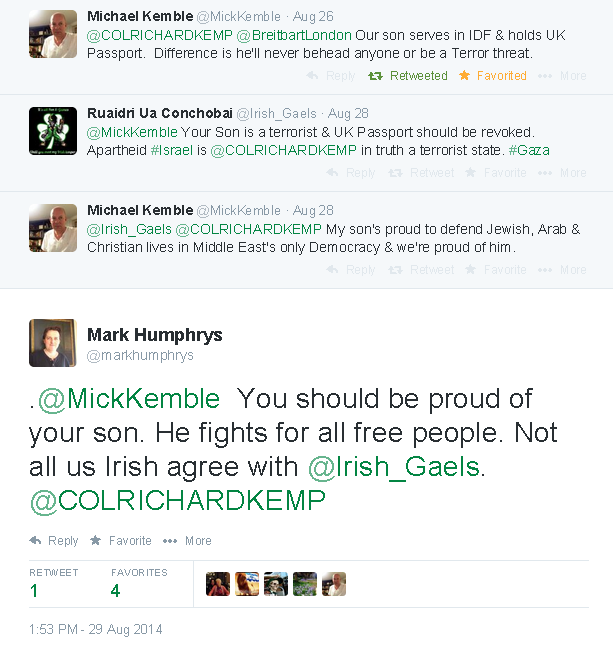 Campbell talks about the hostility she got from ignorant anti-Israeli people in Ireland. I contributed to the comments on the above article. It's important to counter the anti-Israel narrative in Ireland from the likes of "Irish_Gaels" above. For the sake of Ireland's good name as much as anything else. 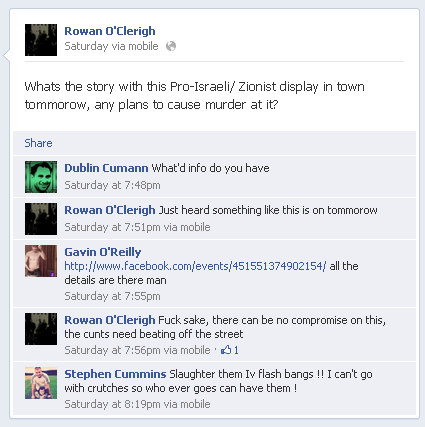 There is an Oireachtas Friends of Israel group. Also called the Oireachtas Ireland-Israel Friendship group. Its membership is unclear. If you have a proper list of members, tell me here. Joanna Tuffy, 3 Aug 2014, confirms the group exists and she is a member. The claimed members of the group as at 2010, according to "Palestine in Irish Politics" by the anti-Israel group Sadaka. This list is inaccurate. See below. Leo Varadkar, 5 Aug 2014, says he is not a member. By May 2018, Varadkar was coming out with boilerplate leftism on Israel. He is right. He is no friend of Israel. 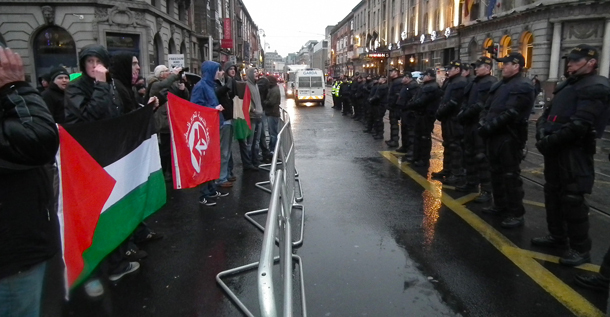 A small pro-Israel rally was held in Dublin on 25 Nov 2012. An aggressive number of Israel haters turned up, requiring a massive police presence to stop them attacking the pro-Israel people. 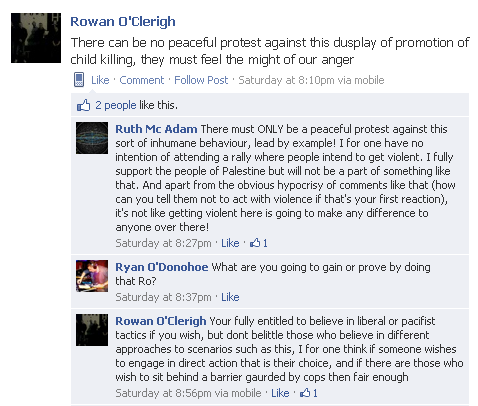 The day before, on 24 Nov 2012, some guy called Rowan Clarke (Rowan O'Clerigh) calls for violence against the pro-Israel rally. (Left) From his facebook (now deleted). He is apparently linked to the Republican Network for Unity. He has a Che tattoo. In the comments above he promotes the freaks of Neturei Karta! His list of "Inspirational People" on Facebook includes Mao and Kim Jong-Il and Castro and Carlos the Jackal! Imagine an Ireland run by the likes of him! It would be like Pol Pot's Cambodia. Counter-protesters display the terrorist flag of the PFLP, the home invasion butchers of the Fogel family in Itamar in 2011. From 11:15 in video here. 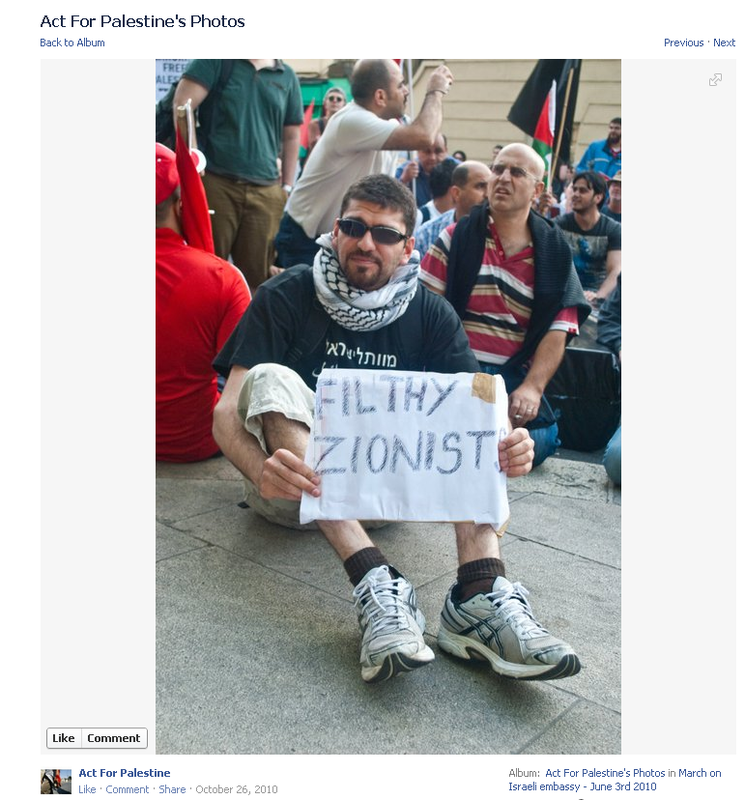 There are also eliminationist chants: "From the river to the sea ..."
The guy behind the camera, Tommy Donnellan, is an open supporter of the Palestinian jihad. 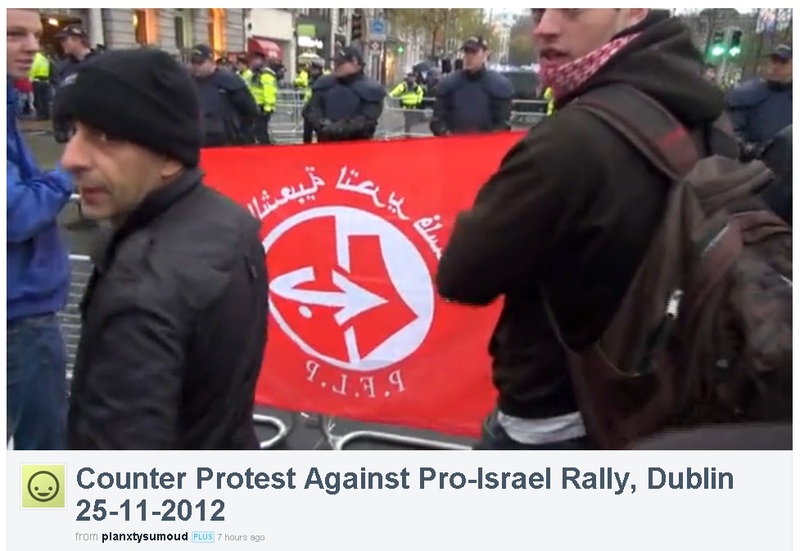 See another shot of PFLP flag from here. 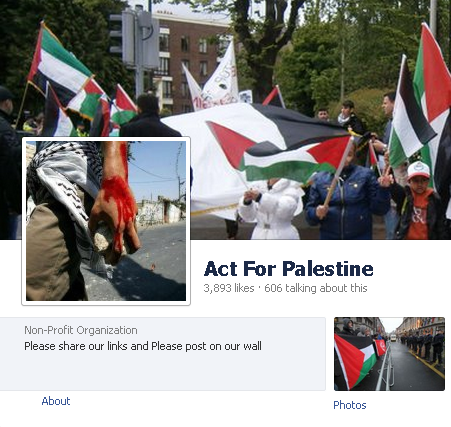 The counter-demo was organised by "Act for Palestine", which promotes Palestinian violence on its front page. 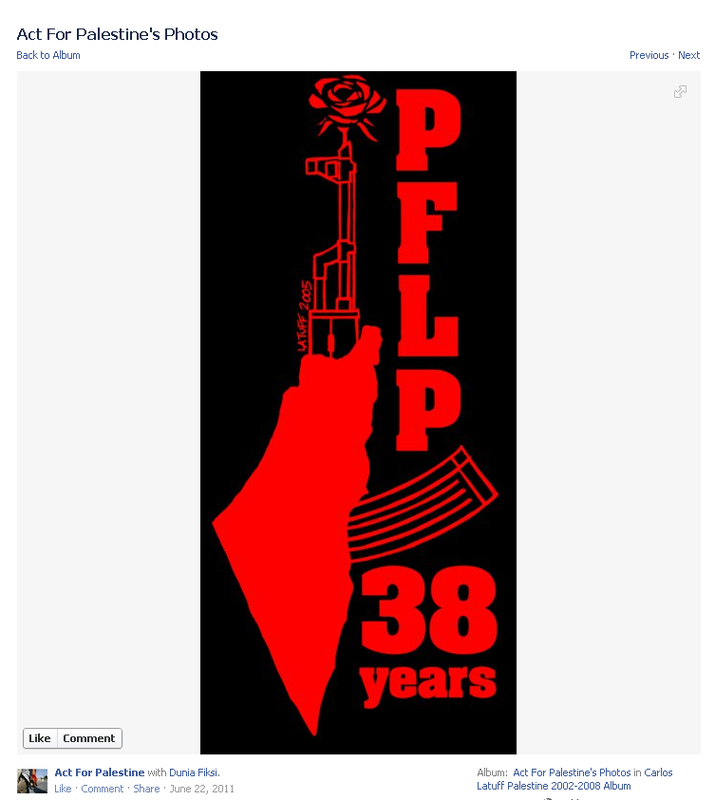 They promote the terrorist PFLP. From here. They promote that guy with the "Death to Israel" t-shirt. From here. On a brighter note, on the other side of the barricade, Irish politician Richard Humphreys made a great speech at the pro-Israel rally. In one moving passage, he said we must always remember that, even if it is self-inflicted, Palestinian suffering is real, and children and non-Hamas-supporters are caught up in the consequences of the appalling decisions of the majority: "As well as solidarity and optimism, I think it is also important to emphasise the need for compassion. Each death or injury of an innocent civilian in Gaza is a tragedy which must primarily be lain at the door of Hamas, but which also calls for restraint and for the path of peace. 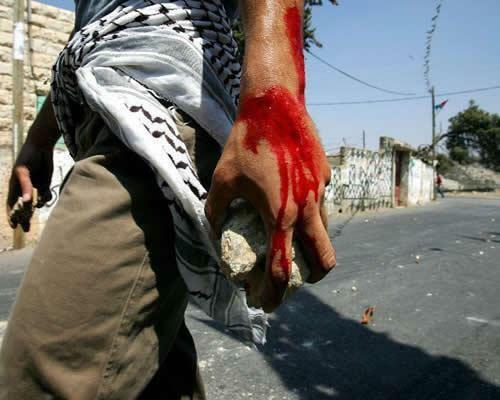 It is essential to recognise that there is a Palestinian perspective and there is Palestinian suffering. Many Arab commentators have taken the lead in pointing out that a great deal of that suffering is self-inflicted but it is real nonetheless." It is extraordinary to think that the above excellent speech appears on the same website as Michael D. Higgins' disgraceful tribute to Arafat. It is good to see that there is some diversity in the Labour Party. YouTube user "MasonWatcher" comments on the above video. I went to the very civilized pro-Israel protest against Mahmoud Abbas' visit to Dublin in 2018. Protest at �ras an Uachtar�in, 22 Sept 2018. I speak in this video from the protest. The Eurovision Song Contest 2019 is to be held in Israel, which prompted an outpouring of hatred and calls for boycott. Open letter from Irish gay activists calling for boycott of Eurovision, 16 Apr 2019. This was signed by David Norris and many others. I signed the Ireland Israel Alliance open letter response, 20 Apr 2019. Copy here.